TORONTO, Nov. 8, 2018 /CNW/ - Avison Young and Apleona Limited ("Apleona"), a portfolio company owned by global private-equity firm EQT, announced today that they have entered into a definitive agreement for Avison Young to acquire GVA, a subsidiary of Apleona and one of the U.K.'s leading and most diverse real estate advisory-led businesses. Avison Young will combine GVA with Avison Young's existing U.K. operations. Subject to the satisfaction of customary closing conditions, the transaction is expected to close during the first quarter of 2019. "We couldn't be more excited to welcome GVA to Avison Young," comments Mark E. Rose, Chair and CEO of Avison Young. "This is a transformational event that underpins our ambition and intent to significantly expand our footprint in Europe and beyond. Avison Young's U.K. business will now be a genuine challenger brand firmly established among the top commercial real estate advisors in the U.K., North America and the world. This acquisition adds gravitas, weight, coverage and profile to our international operations as we continue to solidify our global platform while preserving our culture as a Principal-led company. Avison Young and GVA have complementary businesses in the U.K., and this combination of expertise and talent will better equip us to serve global clients." Rose continues: "We are incredibly impressed with the strategic positioning of GVA, represented by its depth of consultancy and transactional services and long-standing client relationships. We are excited by the international collaboration potential and the opportunity to continue to build our unique partnership model. This transaction will restore GVA to its partnership roots and provide additional opportunities to cross sell clients across Avison Young in the U.K. and globally. Moreover, joining forces with GVA will provide us with a greater level of scale and capabilities to fuel our growth to an even wider audience, and offer an expanded breadth of services to our clients. We look forward to welcoming the highly experienced senior leaders of GVA as Principals and owners of Avison Young, and to working with our new colleagues and clients across the globe." Andreas Aschenbrenner, Partner at EQT Partners, Investment Advisor to EQT, says: "We are thrilled to have found the perfect long-term home for GVA in Avison Young, which is committed to continuing the growth strategy that GVA embarked on under EQT ownership. I am confident that GVA and Avison Young together will flourish, and I am excited to see GVA and Avison Young grow further to become one of the leading real estate advisors worldwide. The sale also marks another important step in transforming Apleona into the leading European provider of real estate management services." Gerry Hughes, Chief Executive of GVA, says: "To say I am delighted by this deal is an understatement. We could not have asked for a better outcome for the GVA business, our clients and our staff. We now enter a new era as a key component of a global real estate advisory platform, which will allow us to further flourish and better serve global clients. I look forward to joining the Avison Young partnership and working with Mark, and I want to thank EQT for the support and opportunities it has given to GVA over the last few years." "Our approach to growth in the U.K. continues to be both disruptive and holistic," adds Jason Sibthorpe, Avison Young Principal and U.K. Managing Director. "Our focus is always client-centric and our enlarged platform will complement our existing offerings, giving our clients total coverage across the real estate advisory landscape. We intend to continue to invest, and we see great opportunity for further growth in all areas, particularly in the transactional space. The history of GVA spans two centuries, and its rich heritage and long-time employees, combined with Avison Young's existing skilled team in the U.K. region, will give us an unrivalled ability to serve all client needs. Our Principal-led partnership model is in the DNA of GVA, and we anticipate great success for our combined businesses." Avison Young intends to optimize its capital structure through a recapitalization. The acquisition and the refinancing will be funded through a combination of cash on hand, a committed financing from Credit Suisse, and additional common equity, including participation by Caisse de dépôt et placement du Québec (CDPQ) and Avison Young's existing employees as well as issuance of shares to GVA employees who will become Avison Young Principals and certain other GVA employees. Avison Young has ample capital to further invest in its global growth. Today's announcement follows Avison Young's announcement on July 16, 2018 that CDPQ, one of Canada's leading institutional fund managers, has made a C$250-million preferred equity investment to accelerate Avison Young's strategic growth plan. 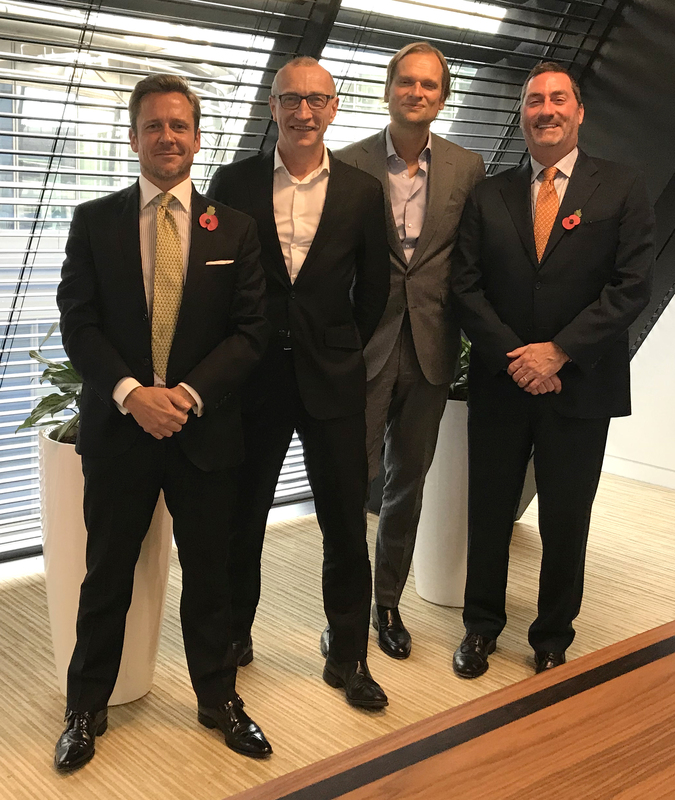 Avison Young made its first investment under its strategic partnership with CDPQ by acquiring leading U.K. firm Wilkinson Williams LLP and opening a new office in London's West End on August 1, 2018. On October 10, 2018, Avison Young opened its first office in Asia, in Seoul, South Korea, with 63 members joining from Mate Plus Advisors Co. Ltd.
Credit Suisse and KPMG LLP are acting as Avison Young's financial advisors in the transaction; and Gowling WLG (UK), DLA Piper LLP (US) and Stikeman Elliott LLP (Canada) are serving as Avison Young's legal advisors. BofA Merrill Lynch is acting as EQT's and Apleona's financial advisor; and Milbank, Tweed, Hadley & McCloy LLP is serving as EQT's and Apleona's legal advisor. Avison Young is the world's fastest-growing commercial real estate services firm. Headquartered in Toronto, Canada, Avison Young is a collaborative, global firm owned and operated by its principals. Founded in 1978, the company comprises 2,700 real estate professionals in 85 offices, providing value-added, client-centric investment sales, leasing, advisory, management, financing and mortgage placement services to owners and occupiers of office, retail, industrial, multi-family and hospitality properties.